This is the first German edition of Coyote Waits. The tenth book in Hillerman's Navajo Mystery Series. This edition is published in 1992 by Goldmann Verlag in Munich, Germany. Hillerman's text was translated from "American" English into German by Wulf Bergner. 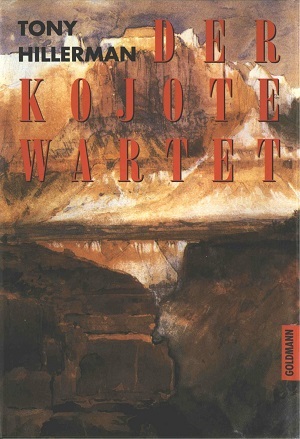 The cover was designed by Design Team München and the cover art is a watercolor painting of the Grand Canyon by Thomas Moran. Moran was a famous American painter who was known for this watercolor scenes of Western American landscapes. Format: Hardback, 19.1 x 13 cm. Binding: Orange boards and spine with the author and the title printed in gray vertically on the spine.